Survivor: The Australian Outback (2001) - 4th place, 13th out - 6th juror. 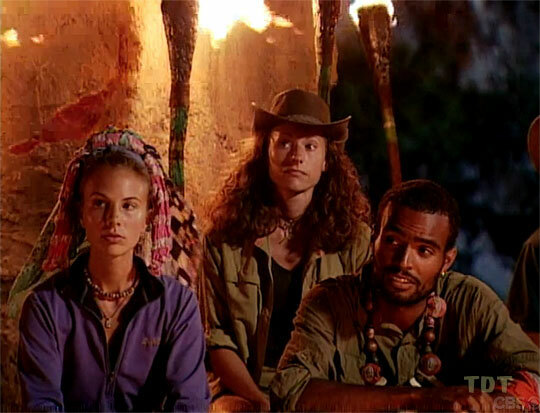 Voted out in Episode 13, "The Final Four" (Day 39). The Australian Outback Ep. 2 RC: "Butch Cassidy" - Jumps, swims, Kucha loses again. The Australian Outback Ep. 2 IC: "Tucker'd Out" - Forced to eat an apple (! ), and in the tiebreaker, Kucha wins. The Australian Outback Ep. 3 IC: "Lock Step" - Keeps up with Kucha, and Kucha wins. The Australian Outback Ep. 4 IC: "True or Falls" - Answers correctly, Kucha wins again. The Australian Outback Ep. 5 RC: "Triage" - Last person "rescued" as Kucha wins its fourth straight. The Australian Outback Ep. 5 IC: "The Maze" - Somehow, Kucha loses, by a lot (5-2). The Australian Outback Ep. 6 RC: "Blind Leading the Blind" - Participates, another Kucha win. The Australian Outback Ep. 9 RC: "Double Play" - Paired with Nick, loses to Colby/Jerri in first round. The Australian Outback Ep. 7 IC: "Perch" - Fourth place; at 8 hrs, 58 min, jumps in exchange for a boat ride back (4th/10). The Australian Outback Ep. 8 RC: "Return to Sender" - Misses the target (bottom 5/9). The Australian Outback Ep. 8 IC: "Don't Fence Me In" - Does not appear to place any discs (bottom 3/9). The Australian Outback Ep. 9 IC: "Hanging in the Balance" - Loses to Amber in the first round (bottom 4/8). The Australian Outback Ep. 10 IC: "Fire and Water" - Does not win (bottom 5/7). The Australian Outback Ep. 11 RC: "End of the Line" - Near the bottom (5th/6). The Australian Outback Ep. 11 IC: "Blue Plate Special" - Eliminated by Colby on his final two shots (2nd/6). The Australian Outback Ep. 12 IC: "Fugitives" - Near the bottom again (tie-3rd/5). The Australian Outback Ep. 13 RC: "Survivor Pentathlon" - Does well, but not as well as Colby (2nd/4). The Australian Outback Ep. 13 IC: "Memory" - Tied with Tina for fewest matches (tie-3rd/4). The Australian Outback, Ep. 9: Jerri Manthey (voted out, 6-2). The Australian Outback, Ep. 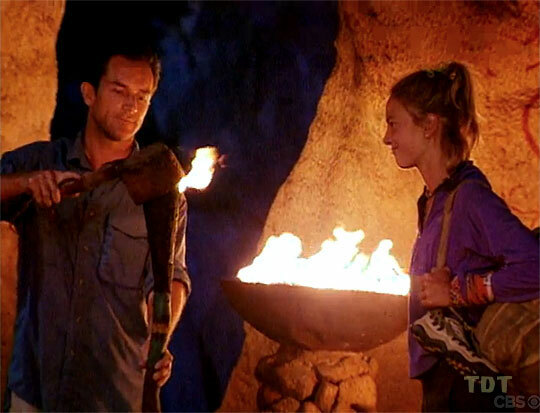 11: Amber Brkich (voted out, 4-2). The Australian Outback, Ep. 9: Two votes, from Jerri, Amber. The Australian Outback, Ep. 13: Three votes, from Tina, Colby, and Keith (voted out, 3-1). Hi, America! Here's your future Fox & Friends friend! Kucha finally makes it to camp! Yay. Yay, Kimmi got one right! I'm not gonna give up, I'll keep fighting. Even if it costs Alicia and Nick their spots in the game. Checking treemail with Amber... wallets? Chocolate and peanut butter. Shaking. You want our tarps? But it rains every day! Tina thinks we should move the shelter, LOL. Like that'll happen. Hey Amber, do you want to flip with us? No. Our camp is washed away. We have NO FOOD. It's so arrogant! It's like he knows he's going to being here after Rodger and I leave! Trying to catch up with Colby. Bonus Uncle Camerman sighting. Elisabeth trailing. Another bonus Uncle Camerman sighting. CBSNews.com transcript of her Early Show interview (4/27/01): "Bye Bye, Bessie"
Jessica Shaw at EW.com (5/23/01): "Interview with 'Survivor' Elisabeth Filarski"
"Elisabeth Filarski is a recent graduate from Boston College living in Newton, Massachusetts. She is a footwear designer and spends her free time creating greeting cards and personalized planners, running and hanging out with her friends and family. Prior to Boston, Filarski lived in Providence and Cranston, Rhode Island, spent time in Belize teaching in the rainforest and spent three weeks in Italy developing products for her job. She describes herself as impulsive, intuitive, and devoted. Filarski enjoys watching football (particularly when her boyfriend Tim is playing), partaking in outdoor sports, and listening to her brother Kenny jam on his guitar. Filarski played softball while attending Boston College. Her birth date is May 28, 1977."